We've had some real mid-winter weather in Montana this month, so it seems like a good time to mention Cut Bank's giant penguin. The penguin was reportedly constructed decades ago to advertise one of Cut Bank's hostelries, and and it still sits in front of a dated motel building near the east end of town. A classic piece of folk art, and almost certainly Cut Bank's best-known attraction. There's some debate. 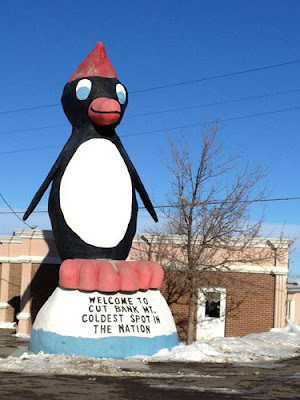 though, about the penguin's claim that Cut Bank is the "Coldest Spot in the Nation." The author of the phrase presumably decided that Alaska didn't count in the rankings ... or Rogers Pass, Montana, for that matter, which was the site of the coldest temperature ever recorded in the lower 48. Still, there's no denying that Cut Bank is down there in the rankings ... somewhere.